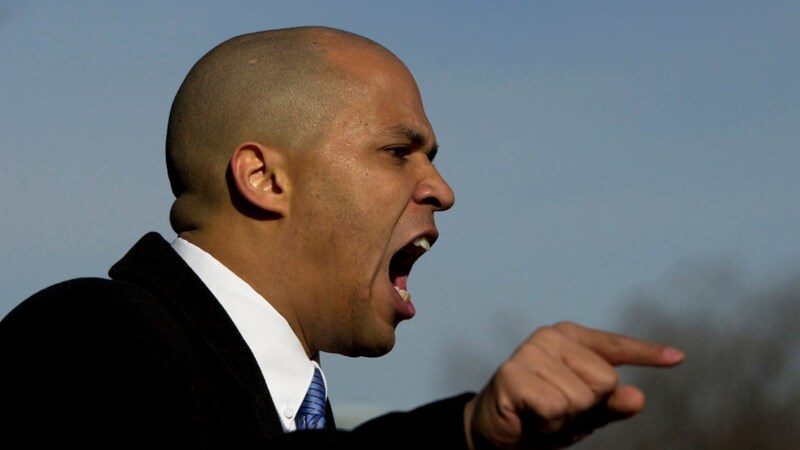 by Byron Bixler It’s 2002 and Cory Booker is in a heated battle. The prize? The mayorship of Newark, New Jersey. The opponent? Four-term incumbent Sharpe James. Booker is young, he’s a passionate speaker and unfortunately for him, he’s the clear underdog in this situation. Working with a small campaign over the course of several months, Booker grows a significant following, but such gains come at a cost, as the Goliath-like Sharpe sabotages him at every turn. This may sound like the premise of a thrilling political drama featuring big name actors in Oscar-baiting roles, but it’s all real and the insights that Marshall Curry’s documentary provides are fascinating. The title of the film, Street Fight, evokes something raw and scrappy in content and aesthetic, and this is exactly what we get. Much like Chris Hegedus and D.A. Pennebaker’s approach to documenting Bill Clinton’s 1992 presidential campaign in The War Room, the style of Street Fight is very fly-on-the-wall. 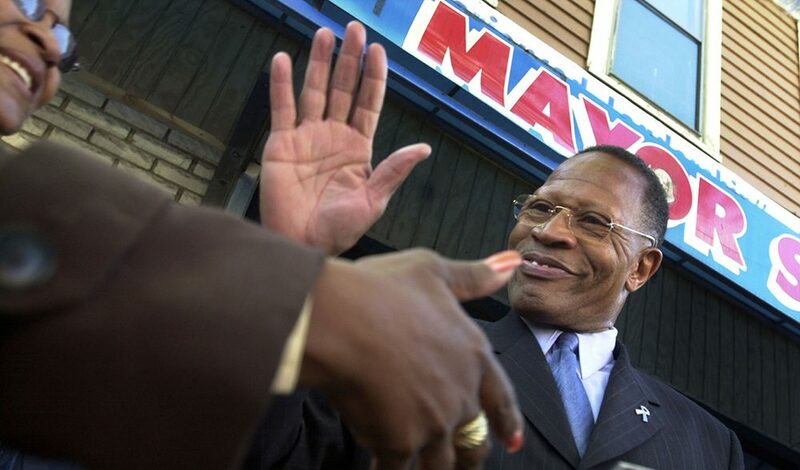 Through handheld footage of campaign headquarters chaos, fierce post-rally clashes between rival supporters and run-ins with police eager to stifle the director’s attempts to film Mayor James at events, we are given the sense of a highly intense political environment. Booker meets opposition everywhere he goes (and he goes everywhere). The viewer first meets the fresh-faced city councilman as he walks from door to door in the narrow hallways of a rundown public housing complex. He’s an amiable guy, he knows his stuff and there’s no doubt that he’s in touch with the issues of Newark’s poorest communities. Despite coming from means, he lives in a low-income housing project himself because he wants to stay close to the community that elected him. However, within minutes of being introduced to Booker, we see him get hustled out of the building by security claiming that he isn’t allowed to campaign there. Booker’s conflict with police and others under Sharpe James’s control becomes a major theme throughout the film. Almost every other scene addresses yet another roadblock set by the corrupt mayor as campaign centers are burglarized, billboards are ordered to be removed and business owners showing support for the upstart candidate are threatened and in many cases shut down. It’s infuriating to see such injustices done under the supervision of a complicit government official, but even more beguiling is the ardent support that James commands. Towards the end of the campaign, various African Americans leaders (Al Sharpton, Jesse Jackson, Cornel West, etc.) come to Newark, stumping for who they believe to be the best representative of black people and the city suddenly becomes the symbolic frontlines for the future of black politics in America. The idea of what defines one as “truly black” grows to be central in the campaign and the documentary takes on a life that the filmmakers couldn’t have anticipated going in. Street Fight ends up being an engrossing rare peek at the machinery behind the American campaign process. The film is made all the more special by the complexity of the election being documented and the unique conflicts that arise from it. At a slim 83 minutes, it’s a speedy watch and although Curry compresses the scope of the election more than I’d like, what’s actually presented is pretty damn thought-provoking. As we see him at this moment in time, Booker is almost optimistic and hopeful to a fault. It’s no secret that he lost his bid in 2002, but Curry leaves the viewer with a sense of progress and impending inevitable change that is crystallized in one memorable moment toward the end. As Booker knocks on doors one night only days before the election, he stops to interact with some children eagerly following him around. After he moves on to another porch, Curry approaches one particularly exuberant child who just shook Booker’s hand. She dares Curry to smell her hand if he doesn’t believe she just met the embattled candidate, to which the filmmaker asks what kind of smell her apparently blessed hand has. Her response: “It smells like the future.” Staged or not staged (considering the way it plays out, I would guess that it wasn’t staged), the line is surprisingly poignant and encapsulates the hope of a new African-American generation hungry for Booker’s brand of young black leadership. This hunger would be sated in 2006 when Booker eventually won, only to be satisfied on a much grander scale two years later when the nation elected its 44th president. It’s far too early to do anything but foolishly speculate, but…could the same be in the cards for Cory Booker? Only time will tell. Tags: Byron Bixler, Election Series 2016. Bookmark the permalink.